Rose signs a new deal - January 5, 2016 James Rose signs a new deal to stay with the Swans for a further two years. James Rose has signed a new deal to remain with the Swans. The Swans have shown an enormous amount of faith in me, now it’s my turn to repay them. 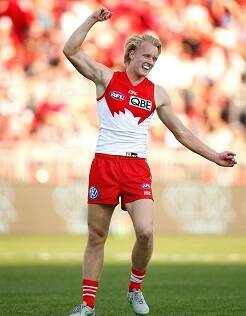 Promising forward James Rose has extended his contract with the Sydney Swans for another two years. The 19-year-old, who was taken with a second round selection in the 2014 National Draft, played two games in his debut season including last year’s semi-final clash against North Melbourne at ANZ Stadium. Blessed with a dynamic leap and innate goal sense, Rose spoke of relief and excitement at signing the new deal which will see the teenager stay with the Swans through to the end of the 2018 season. “It was an easy decision to make,” Rose told SwansTV. “The Swans have shown an enormous amount of faith in me, now it’s my turn to repay them. Recruited from Sturt in the South Australian National Football League, Rose made a stunning debut against GWS in Round 21 by kicking three goals in a matter of minutes after coming into the game as the substitute at three-quarter-time. The debut was just reward for a strong showing at NEAFL level in which the 186cm forward managed 18 goals from 14 games. Rose aimed to use this pre-season to build and help him cement a place in the Swans’ best 22.